Are you one of the needy women that men avoid? Dating a needy woman can be very frustrating for men, and the moment they see your first sign of neediness, they´re quick to pull away. A girlfriend once told me, in a very exhausted + emotional manner, that there were plenty of men who pursued her, but they all were quick to disappear. Why? In a nutshell, a needy woman is someone who will do everything and anything to please a man, and because she gives everything, she requires the man to reciprocate it. She´s too afraid to lose him, she can´t be happy without him. Men are happy to receive. The more they can get away with, the better. But the moment you require them to give back as much as you give, or the moment you complain that you give more than he does, they´ll see you as needy. They´ll lose respect, and they´ll lose interest on you. If you want him to love you, learn how to capture his heart and love you forever. Neediness is also a reflection of your self-esteem and self-confidence, security, self-respect and overall happiness. Is Your Personality Type More Likely to be Needy? I spent the last couple of months studying personality types and how each personality type behave in a relationship. I discovered that while neediness can be attributed to attachment disorder, low self-esteem (caused by many different factors), and a lack of emotional imbalance (this one deserves an entire blog post of its own), your personality type is actually a good identifier if you have a tendency to be needy. Neediness is the result of your own unmet needs. Unless these needs are met, you are likely to continue to display needy behaviors. To find out what´s your personality type and if you have the higher likelihood to be needy in a relationship, take this quiz. Does Your Neediness Turn Men Off? 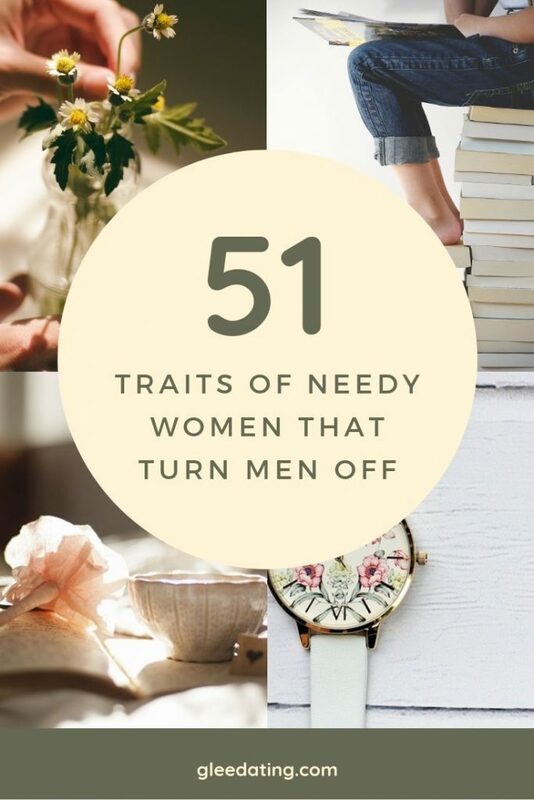 Here are the fifty-one traits of needy women. If you nod to at least five of these, then you belong to the needy quadrant. Let this be your guide in self-reflecting and self-assessing. 1.Your identity is dependent on your relationship. Is your identity always defined by being in a relationship? Ex. I and my boyfriend, I, a footballer´s girlfriend, I and Mike, I, Mike´s third girlfriend, I and (insert guy´s name). You´ve never been single, you jump from relationship to relationship. 2. Your happiness is a reflection of your relationships. You´re happy when you´re in a relationship. You´re unhappy when you´re not. 3. Your self-confidence is a reflection of your suitors, admirers, or boyfriends. You feel beautiful when you are admired. You feel special when you are pursued. But if there´s no man around, you feel ugly or worthless. 4. You get easily jealous. Even if your boyfriend is just checking out the Porsche across the street, you freak out, accusing him of ogling other girls. 6. You need to know your boyfriend´s every move. My brother gets text messages from his girlfriend several times a day asking where he is or what he´s doing. If he´s unable to respond immediately because he´s teaching, it becomes world war 3. 7. You get upset if a guy pulls back, even if it´s to just breath a little. There are six reasons why men pull away in early stages of dating, but there are only two possible responses from you — you shrug it off, adopt a wait-and-see attitude and try to be happy even without him around, or you get upset, bombard him with text messages and phone calls, and unable to function like normal. If you´re the latter, then you´re needy. 8. You need a man to validate your worth. If a man tells you that you´re just a 6, then you believe that you´re just a 6. If he tells you that you´re no longer a 10, then you accept that you´re no longer a 10. 9. You always have fear of losing him. You´re not taking any risk, no woman can steal him from you, because you´re his fence. 10. You give up your routine when you were single in order to accommodate him. If you were doing yoga every after work, you´ll stop doing yoga so you can be with him. 11. You give up your independence. You can´t do things on your own, you can´t go out with your girlfriends or you can´t decide what to do, you always have to wait for him and for his permission. If some girlfriends ask you to go with them for a girls´ night out, you can´t decide until after 10 pm because you´re still waiting for his call. Maybe he´ll call and you don´t wanna miss it. 12. You give up your identity. You change all of your views and opinions based on what your current boyfriend likes and doesn’t like. 13. You accompany him wherever he goes, even to the gym or to a boxing match. 14. You tolerate disrespect. If he cancels your date on the last minute, you´re so willing to do it tomorrow, same time. If he´s late on your date for over 30 minutes, you´re willing to wait a little longer even if your eye liner´s already running. 15. You´re always available. You regularly see him on short notice or when it is convenient for him. You often hang out in his place, and would run to his side with a snap of a finger. 16. You cook an elaborate meal on your first, or even second, date. They say that “the way to a man’s heart is through his stomach”, I´m gonna move heaven and earth to impress him with my cooking skills. 17. You want to stay in touch all the time. You call and text him several times a day, you leave long messages on his machine, you respond to his emails in less than 2 seconds. 18. You freak out if he doesn´t answer your texts, calls or emails right away. You can’t handle waiting to hear from him. 19. You think he doesn´t love you as much as you love him, so you require him to love you more. 20. You over analyze your relationship. Why aren´t you wearing the sweater I gave you on our second monthsary? Don´t you care for me? 21. You have no life of your own. You don´t do other things outside of him, you spend your entire free time for him. Your whole world evolves around him. 22. You want his full attention all the time, even if he´s talking to someone, hanging out with the boys, or watching football. 23. You need nonstop body contact—holding hands, kissing and hugging even in public. 24. You are controlling. You don´t allow him to spend time with his friends. You control who he can mingle with. 25. You require him to introduce you as his girlfriend to everyone all the time. 26. You constantly need reassurance. You keep asking him if he loves you, if he finds you attractive, or if he´s happy with you. 27. You don´t leave even if you should. If a man gives you less importance and affection, ignores or abuses you, you complain but you don´t leave. 28. You stop being the boss of yourself, he becomes your boss. You give away any kind of power you have in the relationship, you become his subordinate, which results to power imbalance. 29. You fear rejection, so you give up your identity in order to be the woman you think he will love and cherish. 30. You can´t be happy alone, so even if you´re not happy in this relationship, you stay. 31. You badly need this relationship, so you are willing to bow, stretch and bend backward in order to please him. 32. You give everything early in the relationship, without leaving anything for yourself, and hoping to negotiate reciprocity later. 33. You are attracted to any man who shows interest in you because you´ve been lonely or dejected way too long. You forget your standards, or you have no standards at all. 34. Your “love cravings” set you up for more relationship failures. You leave an unhappy relationship, only to end up in another unhappy relationship. 35. If a man breaks up with you because of your neediness, you do everything to chase him and win him back. But you only come off as desperate, which drives the man even further. 36. You invest too much or exert effort too early in a new relationship, which cuts the chase. Men want to do the chasing, but if you´re so readily available, it wears off the excitement prematurely. 37. You are willing to sacrifice your dignity over having a relationship with him. It doesn´t matter if he has a girlfriend or is married, if he shows interest in you, then you are willing to have a relationship with him. 38. You lose your friends for him. 39. You give up your career in order to support him in achieving his dreams. You give him your entire savings, or whatever money you got, to help pay his house, live with him and pray that he´ll marry you. But once he dumps you, you end up penniless. 40. You are emotionally dependent on him. You can´t function and be happy without him. You rely heavily on him, which eventually becomes a burden to him. He needs an equal partner who can contribute to the relationship. 41. His mood becomes your mood. If he´s happy, your happy. If he´s annoyed, upset, sad or worried, then you´re annoyed, upset, sad or worried, in that order. 42. You want to change who he is. This is the opposite of the needy woman who drops her identity on a whim, because in this case, you want to change him to suit your need. That includes changing his appearance, his job, his hobbies and interests, and whatever flaws you think he´s got. He´s no longer your potential partner, but he becomes your project. Want to unlock the hidden desires of a man that leaves him loving, devoted and committed to you? Read His Secret Obsession. 43. You are a social media PDA. You post lots of photos of the two of you in your Facebook, Twitter and Instagram accounts. Your Facebook friends are already fed up with your overly dramatic statuses of how much he loves you or you love him, and how blessed you are to have him. In the contrary, he hardly posts anything in his social media about you. 44. You talk about marriage, children and a future with him too soon. 45. You are too nice. If he calls you to pick him up at the airport at 4 am, you jump on your bed to do so. If he has a cough, you spend three hours making a medicinal tea for him. If he wants to renovate his apartment, you bend backward to organize a team of workers at a discounted rate—all in the name of pleasing him. 46. You try too hard to become close to his mom and dad, and his siblings too. You do everything to gain their approval too soon. You buy them turkey for dinner, even if it isn´t thanksgiving. 47. You become besties with his friends too soon. You send friend requests to all his friends in Facebook, and you chat with them like you´re one in their circle. You bake cookies for him and his friends. 48. You say “I love you” first. It´s just an absolutel no-no. No matter how modern you think you are or that you´re a millennial, it´s still strange for a woman to say “I love you” first. It frightens men. 49. You´re still not over your ex and you talk about your ex too much. If you haven´t done the work of letting go your past hurts, you are going to fill that void from your current partner. You´ll require more from him to fill your emptiness. 50. You compete with his ex, or with any woman in his life whom you consider a threat to your relationship with him. Once you compete with another woman, you lower your value. 51. You initiate that serious talk early in dating. Even if you´re still on the getting-to-know each other phase, you ask, “So where do I stand with you? Are we going to be girlfriend and boyfriend?”.